In my opinion, for the last couple weeks, this market has been less about clinging doggedly to set-in-stone predictions, and more about figuring out the correct "if/then" equations and then trading accordingly. I believe it remains that way heading into this week. Early in Thursday's session, the S&P 500 (SPX) edged up over the prior high, which invalidated the most immediately bearish short-term wave count (the "if" part of the equation), and moved into the next target zone of 1568-1571 (the "then" portion). This places the next if/then equation on the table, which I'll discuss momentarily. 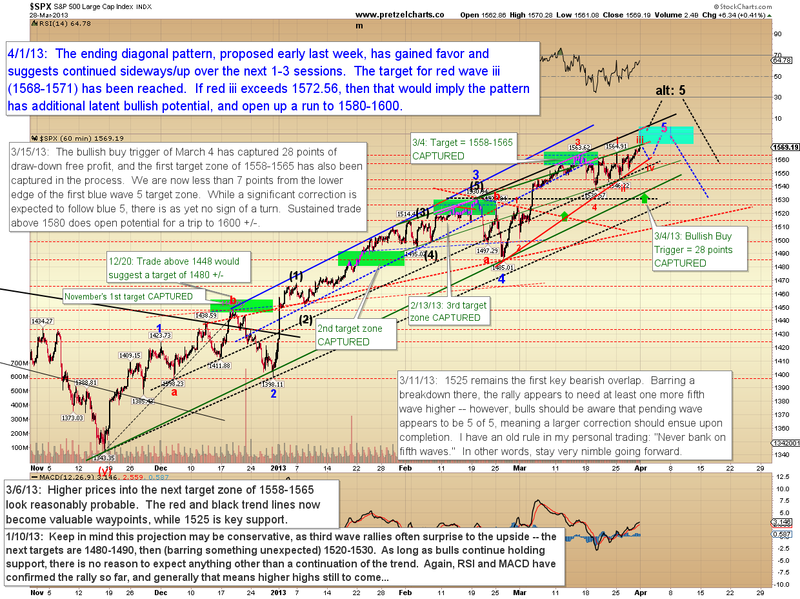 The near-term ending diagonal wave count has gained favor, while the intermediate wave count remains unchanged. The intermediate wave count continues to believe the market is finally approaching a more meaningful correction, though I presently believe this correction will be a buy opportunity, and I remain bullish on the longer time frames. I still find this market environment unusual, however, so while I think it's important to remain cognizant of the long-term potentials, I don't necessarily think it's wise to get too far ahead of the market -- so we're just going to focus on the near-term and intermediate term right now. 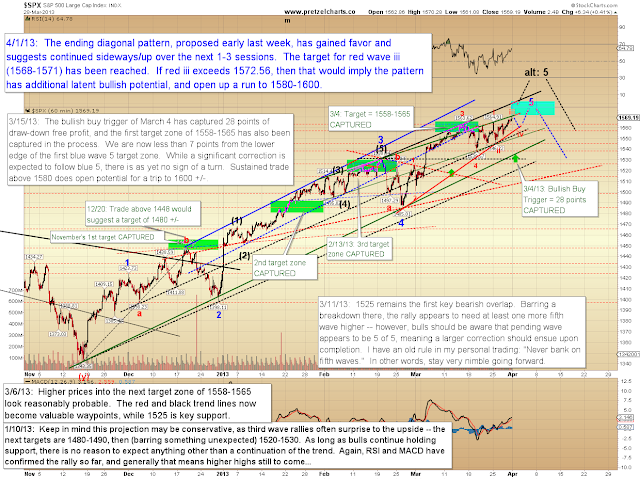 Before examining the wave counts, I'd first like to offer the chart below as additional supporting evidence for the intermediate wave count, and my corresponding thesis that a larger correction is drawing near. This indicator has not yet given a complete sell signal -- however, we can see the full sell signals usually come after a correction has begun, so it's worth paying attention when the indicator is close to triggering, as it is now. Something I like about the current charts is that the market has declared some key levels for us to watch, and those levels are providing our if/then equations. When I interpret the market using Elliott Wave, I take a detailed look at the current pattern and try to anticipate the fractal that's forming. If I can correctly anticipate the fractal, then I can correctly anticipate the market's next move. It's never cut-and-dried, though, because some fractals look identical in the early stages, which is one reason I often bring other forms of analysis to bear. However, the advantage I feel Elliott Wave provides during such times is that there are clear rules which allow us to invalidate certain fractals. While this doesn't always tell us exactly what the fractal is, it still gives us probabilities to work with -- and an invalidation level can most certainly tell us what the fractal is not, which can be very valuable information. Based on the price action of the last few weeks, I'm inclined to believe the fractal forming in the chart below is a pattern called an "ending diagonal." In an ending diagonal, the market forms five waves (labeled i-ii-iii-iv-v below) -- and each of those five waves breaks down into three wave structures. There are two rules for contracting ending diagonals which would allow us to invalidate this pattern and favor the alternate count. In a contracting diagonal, wave iii must be shorter than wave i, but must be longer than wave v. This is why 1572.56 can invalidate this pattern -- crossing that price point immediately would make wave iii longer than i. Ending diagonals make great topping patterns, because they are brutally choppy and keep breaking out just a little bit, only to reverse lower each time, and then reverse again to head back up. Short-term traders become conditioned to believing the market will come back up each time -- and then, finally, it doesn't come back. 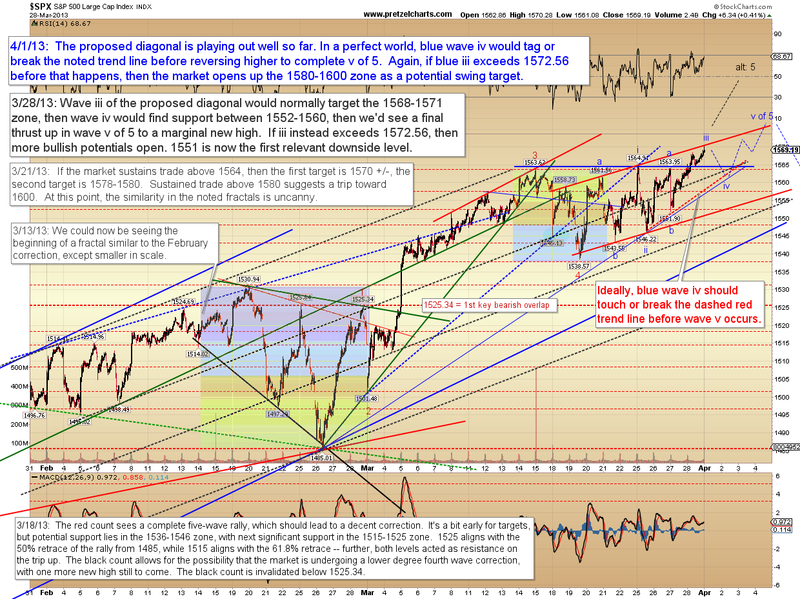 Let's start with the more detailed 10-minute chart, and then examine the hourly for context. On the hourly chart, we can see the rally appears close to completing the fifth wave of the fractal. 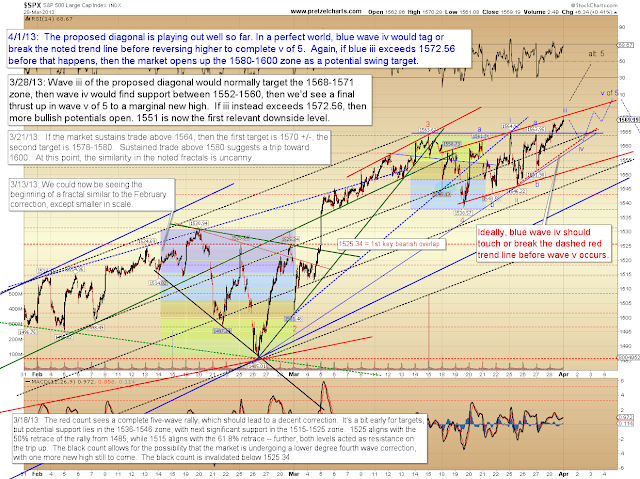 Once this fractal completes, the minimum expectation for a correction would be a trip back into the 1485-1525 zone. That's a very broad target range, but we'll be able to narrow it considerably if and when the correction actually begins. In conclusion, I'm not 100% certain that the near-term pattern is an ending diagonal, but the price action so far has fit. The best thing is that we have some clear levels to watch -- which, from a trading standpoint, actually makes the pattern productive to be aware of whether it plays out perfectly or not. Trade safe. Seems like market has behaved very strangely lately. 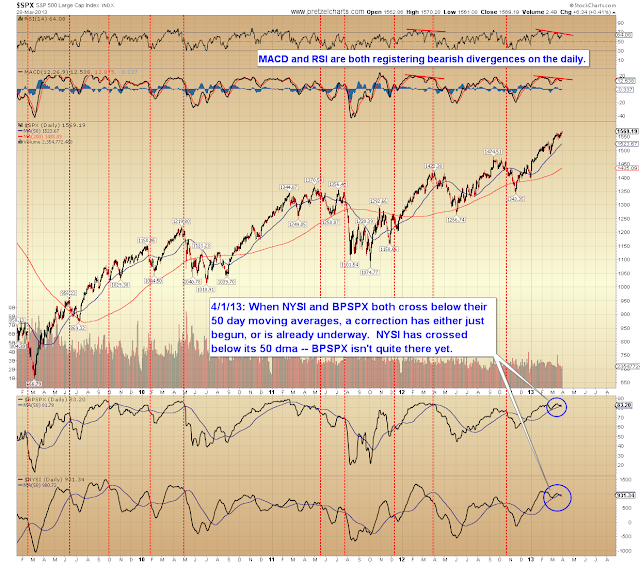 The SP500 keeps grinding higher although the volume has declined. What do you make of the price/volume divergence?